Compare Home Insurance For Cheap Quotes! Compare Insurance Ireland is a home insurance comparison website. We review and compare insurers so you don’t have to. Purchasing the right insurance for your property is vital as your home is the largest and most important investment you may ever make. We recommend that you take a little time to sit down and go through your current insurance policy. It’s important to note that premiums will vary depending on the location and type of property. Household insurance premiums have been increasing due to a rise in claims caused by adverse weather conditions such as snow and flooding. We suggest that you shop around and compare prices and benefits so that you get the cheapest policy. We feature tips on how to reduce your premium and an easy reference guide below, to help you purchase the best home insurance. Compare insurance quotes today and buy online! Are you searching for cheap home insurance quotes? We have outlined an easy to follow guide below on ways to reduce your premium. We hope you find our guide useful and informative. It is important to insure your property for the right level of cover, this may reduce your premium by up to 20%. The cover level should be based on the rebuild cost not the current market value of the property. Make sure that this figure is not too high or too low. Over the last few years there has been a considerable reduction in the rebuild costs associated with property in Ireland. Please note, if you over insure your property you will only get back the cost to rebuild your home regardless of the amount you covered the property for. At the same time it is very important not to understate the rebuild costs. The correct level of cover will ensure you will not have to contribute to the actual construction costs in the unfortunate event you need to make a claim. If in doubt refer to the Society of Chartered Surveyors website, where you can view a guide on rebuild costs. Note: if you have built an extension, conservatory, extra toilet or porch over the last couple of years we would recommend you contact the insurance company to ensure the property is covered for the correct amount. Finally if you are living or own a property in an apartment complex, most management fees will include a block policy that should cover all apartments within the complex. You should refer to the apartment management committee or company to confirm this. It’s important to review the value of your household contents yearly to confirm that you are not paying unnecessary cover levels. When it comes to insuring your contents make sure that you are not over insured. We recommend that you take a yearly inventory of all the items you wish to insure. The easiest way to do this is to make a list of all the items in each room, this will give you a good indication of the appropriate amount of contents to insure. This may help you reduce your overall home insurance premium by up to 10-15%. Please note, you may not be able to insure fixture and fittings such as a fitted kitchen and flooring, although you should include all movable items such as furniture, carpets and curtains etc. However not everything will be covered under the general contents so its important to highlight your valuable items separately i.e. engagement ring, bicycles etc. This is an additional benefit that will insure your valuable items against theft, accidental damage or loss. This cover is mainly associated with items that can be taken outside of your home such as laptops, jewellery and sports equipment. Criteria may vary so always read the terms and conditions carefully. You must decide if you need all the extra cover levels. For example; is “accidental damage” right for these items? There will be a max value which the insurance company is willing to cover these items for, this may vary depending on the insurer. It should generally be in the region of €5k. These items are not usually covered automatically under the contents and will have to be added as additional extras, as a result this will lead to a higher premium. You should review the excess amount on your policy, this amount may range from €125 up to €1k. By choosing to pay for a larger share of the risk you may be offered a cheaper insurance premium. Generally the higher the excess, the lower the premium. The excess is the amount you must contribute towards the claim. Most home insurance companies will offer you a more competitive premium if you have a monitored burglar alarm installed. The insurance provider may request proof of the monitored alarm such as model, make and a bill from the security company. If your alarm has recently been updated ensure you notify your insurance provider as you may be able to get a discount on your premium. Please note, if the property was unoccupied at the time of the burglary and the alarm was not turned on, you may not be covered, always read the terms and conditions carefully. Another point worth mentioning, if you are in a neighbourhood watch area, you should highlight this on the application as you may be entitled to a further discount. Most properties now have smoke alarms fitted. If your property does not we would highly recommend installing one as it may reduce your premium and more importantly it could very well save your life. You should also consider installing a carbon monoxide detector for your own safety. Read your home insurance policy carefully and review the benefit schedule so you understand what is and what is not covered. If you are unfamiliar with some of the terms, take a look at the glossary or phone the insurance company. We would also recommend that you review the claims process, so you know what is required in the unfortunate event you need to make a claim. Conditions may change from year to year so it is worthwhile reading over the document when it arrives to make sure you know the criteria and cover levels. If you are planning to take holidays and will be leaving your house unoccupied for a long period of time, ensure that all electrical appliances, water and heating is turned off. As some insurance companies will not cover claims that arise from properties unoccupied for 30 days or more due to the increased risk factor. We would also recommend notifying your local Garda station and neighbours to let them know that you will be away so that they can keep an eye on your property. Check the policy schedule / benefits so that you are clear on what extras are covered such as a 24 hour help line which can come in very handy in the event of damage or burst pipes etc. Does your home insurance include liability cover, this will cover you in the event that visitors or contractors; (electricians, builders, plumbers) are injured while on your property or they sustain damage to their belongings. It’s important to disclose all information to the insurance provider such as when the house was built, what type of roof you have and the general size of the property. You will also have to disclose claim history, failure to do so may make claims null and void. It is advisable to review your policy yearly and ensure you notify the insurance company of any material changes within the property, such as new windows, conservatory or porch as this may affect your cover. Know your rights, you do not have to buy house insurance from your mortgage provider. Shop around for cheap home insurance, some insurance companies offer special discounts for purchasing online. Always compare like with like to ensure you are getting the best deal. We would recommend that you keep receipts for all expensive items that you have purchased. Many householders take photographs or use identity markers for valuable items to confirm ownership in the event of theft. Item receipts should be placed in a fireproof box and stored away from the property. A good no claims history may lead to cheaper home insurance compared to a history of claims so it’s important to consider the premium before submitting a claim for small items. You may wish to cover minor damage yourself. Note some companies may not be willing to quote if they see a high claims history or alternatively it may be very expensive to take out a policy. If you are not happy with an insurance company’s decision in relation a submitted claim, you must send a written complaint. If you are not satisfied with the outcome of this complaint you can approach the Financial Service Ombudsman, telephone 1890 88 20 90. What does home insurance cover? A home insurance policy will cover your property in the event of loss or damage. The policy should include contents, building, all risks and liability insurance. In essence it is an insurance policy that will offer financial protection for your property. The property should be insured for damage to contents and for damage to the structure of the house. You are not obliged by law to insure the property but if you have a mortgage, most mortgage providers will insist that your house is appropriately insured for the reinstatement value. This is the cost associated with rebuilding your property. Sheds, fences and garden tools. Personal belongings of tenants, not specifically covered in the policy. If you are in any doubt as to whether you’re sufficiently covered, call your insurance provider and check it out. Explosion, earthquake, lightning or fire. Attempted robbery or burglary that caused damage to the property. Oil or water leaks from a damaged tank or burst pipes. Always read the terms and conditions and insurance schedule to ensure you are aware of what is and what is not insured. Wear and tear of structure. Flooding in high risk areas. Remember you will have to pay an excess amount when making a claim, the excess is the amount that you must contribute towards the claim. Contents insurance will cover loss or damage to the contents of your property. Please note, there is a limit on the value you can claim for any single item, so we would suggest that you list expensive items individually, such as antiques, electronics or jewellery. Always review the insurance schedule and terms and conditions carefully. Loss or damage to items on a ‘new-for-old’ basis (up to certain limits). Accidental damage to household equipment, for example, a computer or stereo (you may have to pay a higher premium for this benefit). Loss or damage to items that can be temporarily removed from the property. This does not generally include glass or fragile objects. Food that has spoiled in a fridge because of a power failure or freezer breaking down. Any loss or damage that occurs if you leave your home vacant for an extended period of time – usually more than 30 days. Theft of valuables and money if property was not properly secured. Bills of exchange, deeds, promissory notes, bonds, documents, medals, stamps, coins and manuscripts. Personal belongings that are usually carried outside the home (unless you have specified them). All risks insurance is an optional extra, it will cover you for loss or damage to valuables in and outside your home, terms and conditions will apply. When purchasing a policy you can decide on what you would like covered. This benefit should have extensive geographical coverage for your valuables. So if you decide to take these items (jewellery, laptop) on holidays or on a trip outside the country, they should be covered for loss or damage. Always read the terms and conditions as some items may be excluded. If items are taken abroad there may be a limit on the duration, such as 60 days. In the event of a claim you may be given the amount associated with repairing the item or a sum to replace the item depending on the circumstances. Some insurers may offer you an overall value for unspecified items and an option to cover individual items such as jewellery i.e. engagement and wedding rings. Liability insurance will cover you in the event visitors are injured, have an accident or their belongings are damaged while on your property. Most household insurance policies include public liability cover up to certain limits. This means that your insurance policy would cover costs, fees or expenses that you could be legally liable to pay in certain instances. You should always check that contractors working in your home have their own public liability insurance. Useful tips for making a claim? If you need to make a claim, check first that your policy covers the claim. Phone the claim insurance number to confirm what has happened. If items have been stolen or deliberately damaged or you have lost valuables, inform the Garda immediately. Keep the damaged items if possible as your insurer may need to inspect them. Get estimates as soon as possible for repairing the damage. If you have any problems with the insurance provider, you should in the first instance take this up with their customer service department. If you fail to get a satisfactory response having escalated your complaint to management you can take your complaint to the Financial Services Ombudsman. The Irish Insurance Federation provides a free insurance information service where you can obtain information and advice on all aspects of insurance. This service will also investigate complaints which fall outside the scope of the Insurance Ombudsman Scheme. If in doubt the National Consumer Agency will give you advice as to what your rights are. 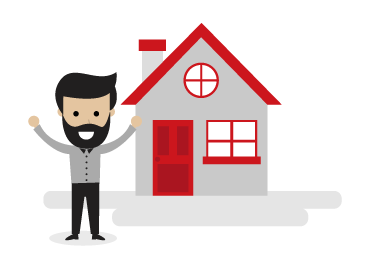 We hope you found our tips for home insurance useful and informative. It’s easy to compare cheap home insurance quotes with Compare Insurance Ireland. Simply fill out a few details about your property such as type, location, claims history and security details (fire and burglar alarms) then select “Get Quotes”. Once you have completed the relevant sections of the form you can compare the market to get the best deals, review prices and then buy online! Home insurance is vital for all properties. However it is also important to be aware of preventative measures: such as conducting annual property structure, fire and burglar checks. We have outlined some suggestions below. Avoid water damage to your property by getting your gutters cleaned and checked at least once a year. Blocked gutters can cause water damage and dampness to walls. Check roofing tiles and felt roofs for cracks or broken tiles, it’s important to get this repaired as soon as possible or at least before the winter months to avoid water damage. If you have an open fire, ensure you get the chimney or vent cleaned annually, as this may cause a fire hazard if there is a build-up of debris in the vent. You should have at least 2 smoke detectors in your home, we would advise that these are checked twice yearly to ensure they are working and the batteries are not low. You should have a fire drill no matter what type of property you occupy, conduct this drill at least twice a year. It’s always better to be safe than sorry. Turn off all electrical appliances and lights before going to bed, ensure you do not leave an open fire unattended. When vacating your property ensure you close and lock all windows and doors. If you don’t have window locks, consider getting good quality locks fitted to both windows and doors. If you have an alarm ensure you set it before leaving, this will reduce the risk of your home being burgled. Always ensure your alarm is installed and fitted by a reputable accredited company. Security sensor lights are a good idea as they are a great deterrent to prowlers and unwelcome visitors. If you are planning a trip or a weekend away, ask a neighbour or a relative to throw an eye on your house, you should also inform the Gardai so that they can keep an eye on the property. If you have milk or newspapers delivered, phone the delivery company and cancel the order for that specific period. A door peek/viewer is a great idea as it allows you to see who is outside before opening the door. A door chain is relatively inexpensive to get fitted and can offer you peace of mind when opening the door to strangers. Always ensure the chain is on when answering the door. Save the number for the local Garda station into your phone, should you need to call them in case of an emergency. If you have a garage, out building or shed invest in a good lock and perhaps a security sensor light as burglars may use your own tools to break into the property. If you arrive home and notice a break in, don’t enter the property call the Garda immediately. We would highly recommend a monitored alarm this will also help to reduce your home insurance premium. Home insurance quotes and policies are provided by O’Callaghan Insurances. Automated decision making; if in the event that you would like a decision reviewed please phone the above number to discuss. Thank you for visiting our home insurance comparison website, we hope you found it informative and useful.